I tend to make a lot of dishes that involve tomatoes and basil during the summer, when my garden is full of fresh tomatoes. Caprese salad is one of the simplest and easiest ways to combine these ingredients, which pairs tomato and basil with fresh mozzarella cheese. 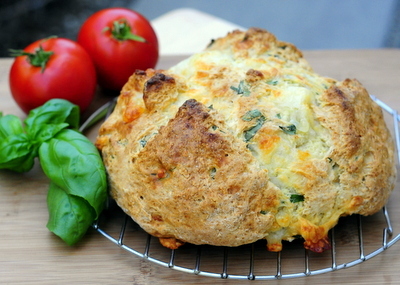 This Mozzarella and Basil Bread was inspired by caprese salads. You’ll notice that it doesn’t use tomato in the bread itself, but that is because the bread includes the other two elements of the salad and can be served alongside fresh or roasted tomatoes to enjoy them when they are at their best. The bread is a quick bread, meaning that it doesn’t use any yeast and is ready to go into the oven within a few minutes of starting to make the dough. Since it has no yeast, it is leavened with a combination of baking soda and baking powder. 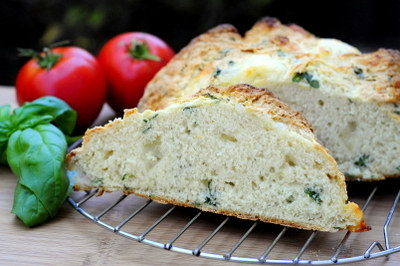 The bread is a savory buttermilk loaf that is packed with fresh basil and fresh mozzarella. The easiest way to chop the basil is to gather the leaves together into a pile, gently roll it up and cut the roll into fine strips with a sharp knife. Since the basil is going into a bread, you don’t need to be as gentle with it as you would when making a salad (where you would want the basil to look picture perfect), but this is a quick and easy way to chop it. The mozzarella I buy often comes in medium-large balls, which are perfect for making caprese salads. I chopped up the balls into 1/4 – 1/2-inch pieces and added them to the dough. You’ll get nice pockets of cheese throughout the bread, as the cheese will melt during baking without completely disappearing into the dough. If you don’t have balls of mozzarella to work with, you can use shredded mozzarella instead of mozzarella chunks. You can also use string cheese, which is typically mozzarella cheese, and cut that into chunks if you’re in a pinch! The bread is at its best when it is fresh and still very slightly warm, but it will keep well-wrapped for a day or two after baking. It can be eaten plain, topped with tomatoes or toasted and served alongside eggs for breakfast. In a large bowl, whisk together flour, sugar, baking soda, baking powder and salt. Add in buttermilk and stir with a spoon or spatula until the dough starts to come together. Add in basil and mozzarella and continue to mix the dough until the dough is well combined. Turn dough out onto a lightly floured surface and knead for about 1 minute, to smooth the dough and shape into a ball. Place dough ball onto prepared baking sheet. 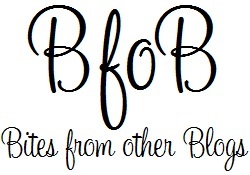 Brush with 1 tbsp buttermilk. 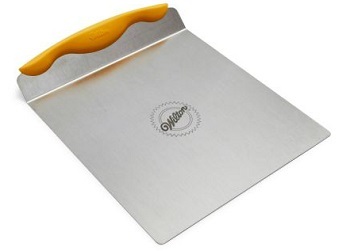 Using a sharp knife, cut a large X in the top of the dough. Bake for about 26-30 minutes, until bread is golden. Transfer bread to a wire rack and allow to cool completely before slicing. Fabulous flavor combo!! I want this in my life! Looks really nice. Would make a tasty appetizer or bread to have with a BBQ! I just made this. I needed at least one additional cup of flour, which. I discovered the hard way (while wrist deep in dough). I used the spoon/sweep and level method of measuring flour. I think it would also be helpful to add a description or picture of what size the dough ball should be before going in the oven. Against my better judgment, I kept it in a ball instead of flattening it at all. It has been in the oven for over an hour. Still pretty doughy. It smelled great when it first baked though!